Every year, million of Canadians catch the flu, usually in the late fall to early spring. Some people are only mildly affected, while others get very sick. Most people recover from the flu in a week or 10 days, but other may develop serious complications, such as pneumonia, that can send them to the hospital. The best way to protect yourself is by getting a flu shot every year. The virus in the flu vaccine has been killed, meaning you cannot get the flu from the flu shot. The flu vaccine is like a picture of the flu for your immune system to see and “rehearse” for. This way, if you ever get exposed to the flu virus, your body already knows what it looks like and what to do. 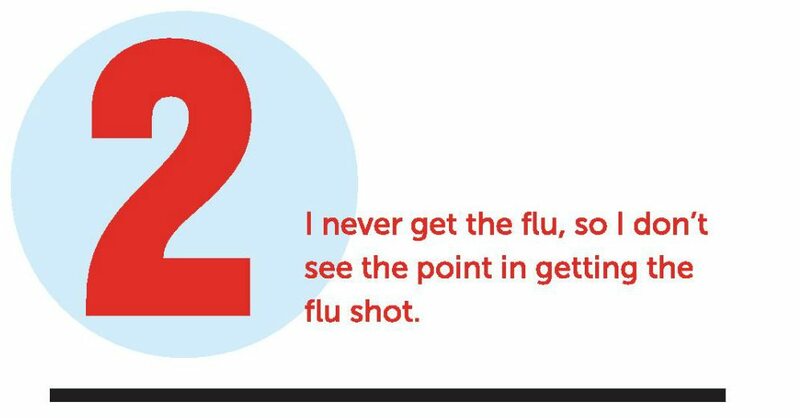 The flu shot does not become effective until 2 weeks after you get it. 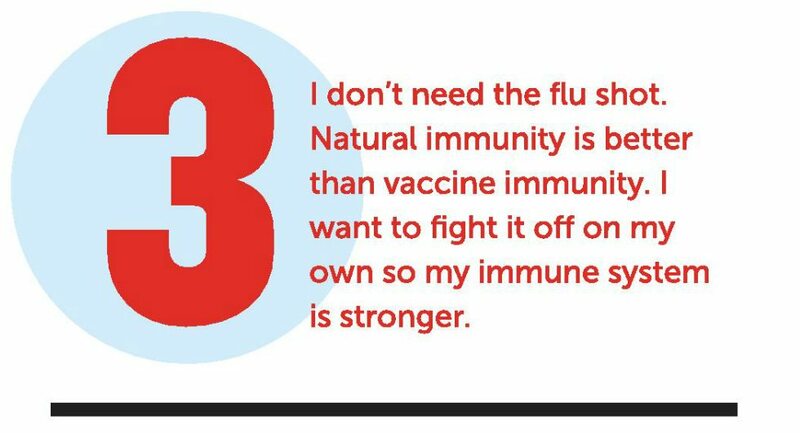 Your body needs time to build antibodies to the flu. Appearance of cold and flu symptoms after getting the flu shot are not a result of the flu shot. Flu shots are generally given during clod/flu season. It’s very possible that someone has an underlying cold or flu before they get their flu shot, but their symptoms haven’t appeared yet. Then after they get their flu shot, symptoms from their underlying illness begin to appear. The flu shot cannot protect you from getting a cold. You are still vulnerable to the common cold after getting the flu shot, so it’s always a good idea to practice and hygiene and other preventative measures to keep yourself healthy. There is always a chance of getting the flu even if you didn’t get it last year. Keep in mind that the flu shot isn’t just for you – it’s meant to protect the people around you as well. Vulnerable populations, including children and the elderly, are most susceptible to hospitalization as a result of the flu. Having the flu shot is good for you too! If you’ve had the flu shot and you get exposed to the flu virus, you won’t be nearly as sick as you would be if you didn’t have the flu shot. It’s also good to get the flu shot each year, as there are different flu viruses year to year. The purpose of the flu shot is to expose your immune system to different strains of the flu so it knows what the flu looks like and can build antibodies to it. If you get the flu, your body will still create antibodies to the flu whether you had the flu shot or not. The only difference is that the flu shot uses a harmless, inactive virus to trigger the body’s natural immune response to provide protection against the flu, without the risk of getting the flu. 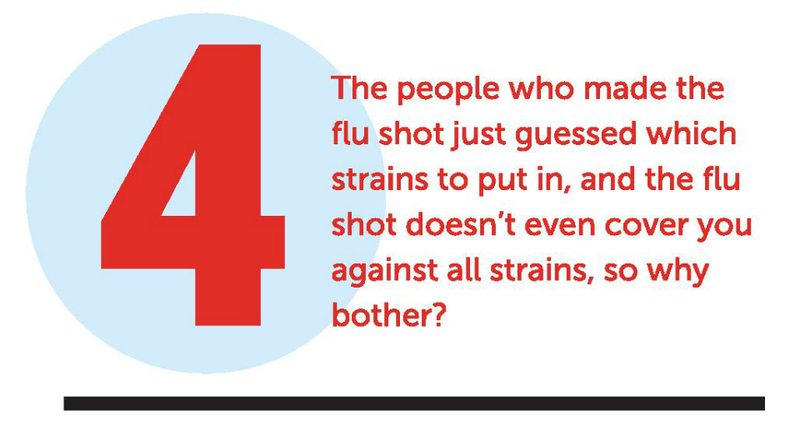 Experts develop the flu shot through months of research and with an educated opinion. Yes, the flu shot only covrs you against certain strains. However, the strains are chosen based on research and data – it’s not just a guess. Even when the virus in the flu shot is not closely matched to the seasonal flu virus, the vaccine can still protect many people and prevent flu-related complications. This protection is possible because the antibodies made in response to the flu shot can provide some protection against different but related flu viruses. Plus, it’s better to be covered against some of the possible strains than none at all. Did you get your Flu Shot? Keeping your records up-to-date is an important part of your care. If you have already received a flu shot and it wasn’t at your physician’s office please fill out the form below. If you would prefer to call us, please phone 1-519-273-7017. Where did you receive your flu shot? *Location ---pharmacypublic clinic Who is your physician? https://www.sfht.on.ca/wp-content/uploads/2016/10/did-you-get-your-flu-shot.jpg 696 1300 Stratford Family Health Team https://www.sfht.on.ca/wp-content/uploads/2016/01/SFHT-Logo-CL.png Stratford Family Health Team2016-10-19 12:41:062017-05-16 12:16:28Did you get your Flu Shot? Congratulations to Dr. Weir on his retirement! ©2016 Stratford Family Health Team. All rights reserved. | a Collin Gibson Creative site. Let us keep you in the loop. For your Family Doctor's phone number please click here.